I was outside taking the mail down to my grandfather when Sweet Boy#1 thundered out of the house shouting–“He said YEEEESSSSSSSS!” Hmmm, I knew that the he could only be the Hunky Hubby…but what had he said YEEEEESSSSSS to? It didn’t take me long to find out. 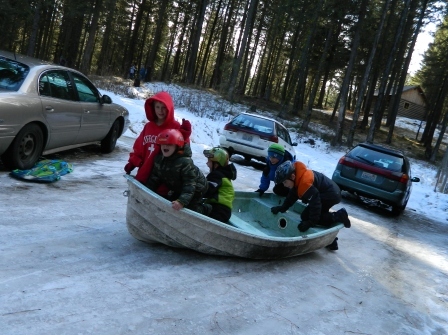 My three boys and the camp cook’s two grandsons quickly hauled a dilapidated row boat to the top of the driveway and the sledding adventure began. Yes indeed, a boat does make an excellent sled. There were a few cringe-worthy moments when they zoomed across the camp road and almost hit a tree, and when they plunged down a small embankment toward the sports court and hit some rocks…but all in all the experiment was a smashing success. This brings back great memories from California when your sister and her brother were in Christian school and for PE and breaks would sled down a huge hill……in an old turtle top carrier filled with 6 kids. A bit hairy at times but great fun!